The 1950s saw the emergence of a new and more adventurous strand of political and social satire evidenced in books and newspapers, on stage and on radio, and especially on the burgeoning new medium of TV, but it also found its expression in music, and one of the most individual and celebrated musical satirists of the time was Tom Lehrer. A mathematician and academic by profession, he recorded a 10” LP of his first collection of songs in 1953 “Songs Of Tom Lehrer”, which gradually brought him to public attention, following it several years later in 1959 with a ‘Live’ LP of new material “An Evening Wasted With Tom Lehrer” which was also recorded in a studio environment that year as “More of Tom Lehrer”. 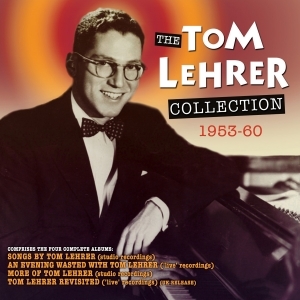 In 1960 a further ‘live’ album including material from his first album was released as “Tom Lehrer Revisited”, the US version comprising a side recorded at the Massachusetts Institute of Technology and a side recorded in Australia. The Decca UK release comprised the same songs drawn entirely from the MIT concert. This 2-CD collection comprises the complete content of all four LPs, using the Decca UK version of the last of those. It’s a comprehensive and thoroughly entertaining anthology of his best-known repertoire with studio and ‘live’ versions of his hilariously irreverent and off-the-wall compositions.